Ongoing investigations continue to uncover growing numbers of casualties left behind by a deadly explosion that rocked Faisal neighborhood in Giza on Sunday. Giza Security Director Ahmed Hegazy has stated that the explosion left one woman dead and 11 injured, reported state-owned media al-Ahram. Meanwhile, al-Watan reported growing figures to two deaths and 15 injuries. According to al-Watan, a gas leak caused the explosion which led part of the residential building to collapse. Ambulances and security forces, including bomb-disposal teams, have been sent to the scene of the incident. Images taken by journalists working for Youm7 showed extensive damage to residential buildings. 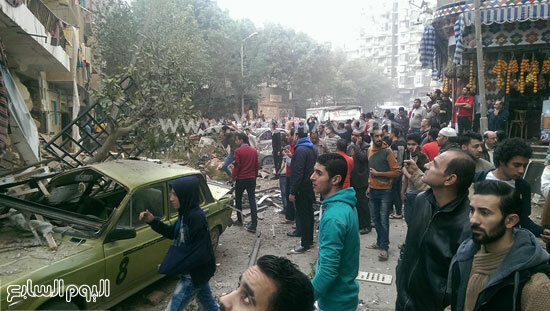 Shortly following the explosion, the Security Director of Giza visited the scene of the incident with investigators to determine the cause of the explosion. Bomb detection dogs were also sent to the scene to determine whether there are any explosives located near by, reported Al-Ahram. Initial scan of the neighborhood shows no trace of explosives.